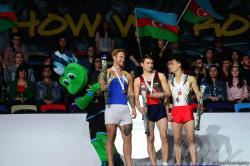 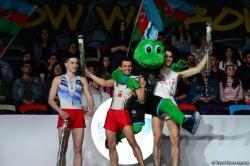 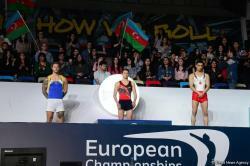 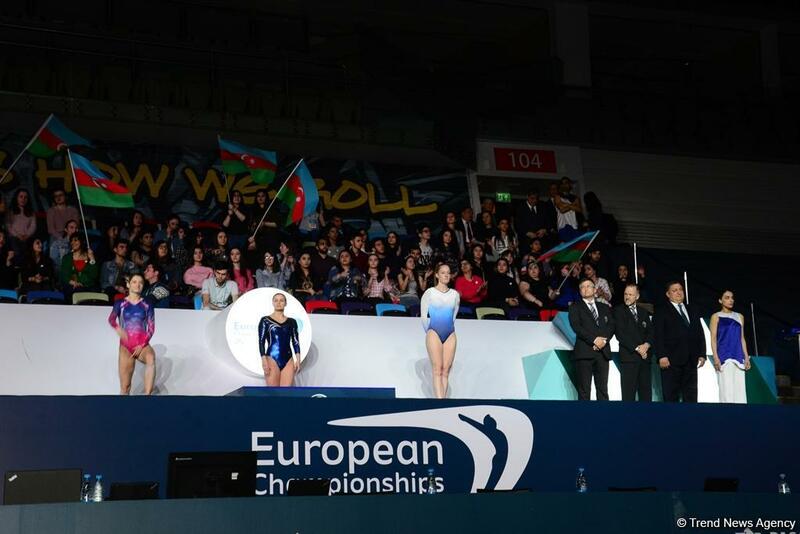 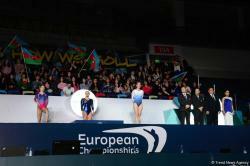 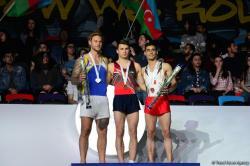 The ceremony of awarding prize winners in competitions in individual and synchronized trampoline among men and women, double mini-trampoline among men and tumbling among women was held at the National Gymnastics Arena in Baku on April 15. 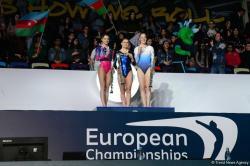 In individual trampoline competitions among women, a gold medal was won by representative of Russia Yana Pavlova, silver medal was won by representative of Belarus Hanna Hancharova, while UK gymnast Katherine Driscoll won bronze medal. 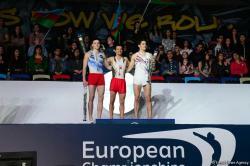 In this category among men, the first place also went to the representative of Portugal Diogo Ganchinho, gymnasts from Belarus Mikita Lyinykh won the silver medal, while French gymnast Allan Morante won the bronze medal. 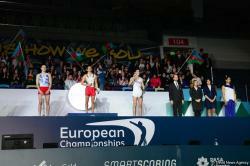 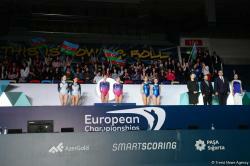 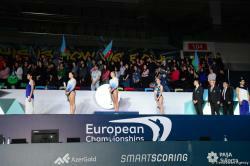 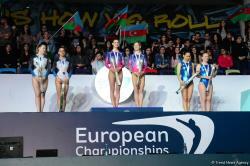 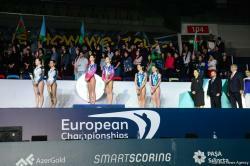 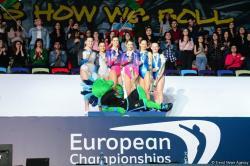 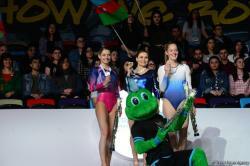 In synchronized trampoline competitions among women, a gold medal was won by representatives of Belarus Hanna Hancharova and Maryia Makharynskaya, silver medal was won by representatives of Azerbaijan Sviatlana Makshtarova and Veronika Zemlianaia, while Ukraine gymnasts Svitlana Malkova and Natalia Moskvina won bronze medal. 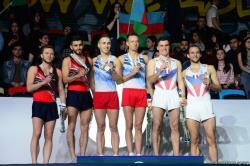 In this category among men, the first place also went to the representatives of Belarus Aleh Rabtsau and Uladzislau Hancharou, second place also went to the representatives of Russia Mikhail Melnik and Sergei Azarian, the third place went to the representatives of France Pierre Gouzou and Josuah Faroux. 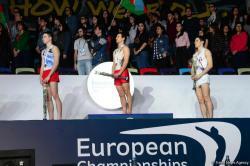 In double mini-trampoline competitions among men, the top three winners were lined up as follows: Vasilii Makarskii (Russia), Jonas Nordfors (Sweden), Diogo Costa (Portugal). 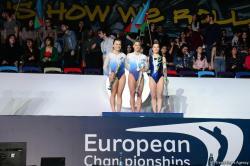 Lucie Colebeck (UK) became the champion in tumbling among women, the silver medal was grabbed by the Megan Kealy (UK), and Viktoriia Danilenko from Russia became the third. 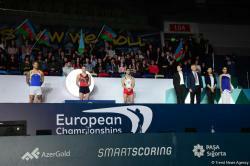 The medals were presented by the members of the UEG technical committee on trampoline gymnastics Patrick Siegfried, Luis Nunes, Babette Van Wetering and Konrad Bojakovski, UEG executive committee member Erik Mogensen, UEG spokesperson Tina Gerets, deputy minister of youth and sports of Azerbaijan Ismayil Ismayilov, secretary general of the Azerbaijan Gymnastics Federation Nurlana Mammadzadeh, presidents of the Federation of Gymnastics of Portugal, Bulgaria, Latvia and others.